A much wittier reply came to mind immediately after I clicked the ‘Send’ button. As with any writings, you see the mistakes after you publish it (well, you see a lot before then, but you leave no witnesses ;-)). 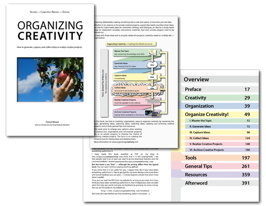 So, here’s an errata for the second version of Organizing Creativity. You find the version number on page 3 (Acrobat’s counting), above the trademark disclaimer. 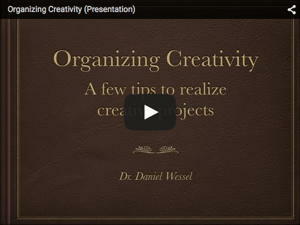 Version available on this site as “free” PDF-file. Corrected this very annoying spelling error. Note that the versions on Amazon, CreateSpace, Lulu, etc. are still 2.2. He has finished chapter 2 — I’ll update the book once the corrections have reached a critical mass (and I am sorry to say they will do this quite quickly — I made quite a lot of spelling and grammatical mistakes). There is a subheader missing in the Table of Contents (Digital Tools: Software). BTW, there is now a table of contents page of the book. Forgot the version number (should have been 2-0). I had downloaded the free version of your book last week and I instantly liked it. I have already placed an order in Amazon.de. I have found a spelling error in the e-copy and I thought I should let you know asap. Please correct “stationary” (not moving) to “stationery” (writing instruments). Only in page 206, its written correctly as stationery. In all other pages, it is written as ‘stationary’ while you intended to write as ‘stationery’. Daniel, you rock!! Fantastic book…. and thanks for writing the book and constantly updating your blog. first of all thank you very much for writing this book and this blog. I just discovered both today. I find it particular resourceful and interesting, because I am working at the moment myself on a PhD thesis, and it is a delight that you share all your experience and information with us. I feel bad posting already in the errata section, but rather now then later… There is a typing error on your e-book on page 300, 4th paragraph, first line: prisons1 instead of prison. thank you for the positive feedback 🙂 And yup, it’s a typo — it was supposed to be uppercase (footnote).